New York, USA -- In recent months, militant atheists have tried to convince us religion ought to be expelled from public as well as private life. It is not hard to imagine how their salon wisdom would have fared last week in the streets of Rangoon, where ordinary Burmese protesting against a military dictatorship rallied behind Buddhist monks - the "highly revered moral core", as the New York Times put it, of Burmese society. If the images of saffron-robed mendicants braving police brutality seem oddly familiar, it is because Buddhist monks left their monasteries and led protests against political repression frequently in the 20th century. So great and prolonged was the suffering of war in Indochina that the Buddhist attempt to alleviate it may seem a distant memory. But it was the self-immolation of a monk in Saigon in June 1963 - rather, pictures of him serenely meditating as flames devoured his body - that first troubled America's conscience about what was then an obscure war. Thich Nhat Hanh, another Vietnamese monk, was a prominent figure in the anti-war movement in the US who eventually persuaded Martin Luther King to pit his voice against the destruction of Vietnam. In Cambodia, where the Khmer Rouge killed almost all the 60,000 monks, the Buddhist monk Maha Ghosananda became a major figure in the reconstruction of his country. In September 1987 Buddhist monks and nuns began the first major political demonstration in Tibet in years by unfurling the Tibetan flag in central Lhasa. They were arrested and severely beaten, sparking off clashes between Tibetans and police that provoked Hu Jintao, now China's president and then the Chinese administrator in Tibet, to declare martial law. How did a supposedly meditative tradition produce political protesters? If "religion is a poison", as Mao Zedong informed the Dalai Lama - a sentiment echoed by the secularists of our time - why then has Buddhism proved such an effective means of mass mobilisation against tyranny? The Buddha himself was no political theorist or activist. He preferred to address the question of what constitutes the ruler's right to rule. Unlike the theorists of ancient India who claimed divine sanction for kingship, the Buddha did not find the ruler's legitimacy in some transcendent realm. As the many stories about ideal kings in the Jataka Tales - a compendium of Buddhist stories - attest, righteousness is the only proper basis for the ruler's authority. 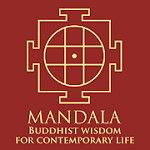 The Buddha preferred small political communities in which all members shared the power of decision-making. In his lifetime, however, he witnessed the emergence of large states. Aware that these impersonal regimes exposed many people to a sense of powerlessness and insecurity, he hoped that the Buddhist sangha, or monastic order, would base itself near urban centres and help give newly uprooted people a sense of spiritual community and tradition. Thus Buddhist monks, living not in forests but in retreats close to populated settlements, are traditionally bound to laymen by an ethic of social responsibility. 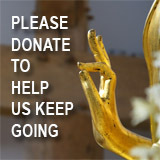 Not surprisingly, in Tibet and Burma, where a modern, militarised state tyrannises a largely pre-modern and unorganised population, monasteries have been exalted as alternative centres of moral and political authority, and monks and nuns have come to spearhead resistance to unrighteous regimes. Certainly, Buddhists are not immune to ideological delusions. In early 20th-century Japan, and in Sri Lanka in the 1980s and 90s, many Buddhist monks succumbed to the lure of nationalism and militarism. Nevertheless, with its absence of dogma and emphasis on intellectual and spiritual vigilance, Buddhism has proved to be less vulnerable to fanatical zeal than not only other major religions, but also such modern ideologies as nationalism and secularism. As Nhat Hanh exhorts, echoing a major theme of the Buddha: "Do not be idolatrous about, or bound to, any doctrine, theory, or ideology, even Buddhist ones. All systems of thought are guiding means; they are not absolute truth." It helps, too, that Buddhist political methods aim, relatively modestly, at dialogue and moral conversion rather than total revolution. Writing to Martin Luther King in 1965, after another Buddhist self-immolation in Vietnam, Nhat Hanh explained that "the monks who burned themselves did not aim at the death of the oppressors, but only at a change in their policy. Their enemies are not man. They are intolerance, fanaticism, dictatorship, cupidity, hatred and discrimination which lie within the heart of man." Maha Ghosananda, who lost his entire family in the Cambodian killing fields, insisted on including the Khmer Rouge at UN-sponsored talks on the future of Cambodia, claiming that he wanted an end to antagonism, not to antagonists. (Such practical wisdom traditionally preserved peace in Afghanistan's tribal society, and the country's current president, Hamid Karzai, appears to have embraced it by offering a seat in his cabinet to the Taliban.) Similarly, Samdhong Rinpoche, the monk prime minister of the Tibetan government in exile in India, claims he opposes the injustice and violence of Chinese rule rather than the Chinese people or state. Calling for a Gandhian-style campaign of satyagraha, or non-violent resistance, Samdhong Rinpoche asks Tibetans to actively reject Chinese rule through non-cooperation and disobedience, without hating or harming any Chinese. Both he and the Dalai Lama have reservations about even an economic boycott, which they believe hurts ordinary people more than it damages governments. Living through a worldwide upsurge of violence, most of us may find it hard to conceive of Buddhist principles as politically efficacious. Nevertheless, the history of the modern world furnishes many examples of political victories achieved through moral persuasion and spiritual strength: national self-determination in colonised countries, the civil rights movement in the US, the velvet revolutions in Russia and eastern Europe, the end of apartheid in South Africa, and the gradual spread of parliamentary democracy around the world. Today the Burmese generals confront the "authentic, enduring power" of people, before which, as Hannah Arendt presciently wrote in her analysis of the Prague Spring of 1968, a repressive regime eventually surrenders. The Buddhist monks chanting on the streets of Rangoon may look naive and defenceless when you consider the power of the political-military institutions of the modern, secular era that they are up against: heavily armed nation-states with hyper-competitive capitalist economies. Certainly, the Burmese generals know the way the world works. Apparently isolated, they play shrewdly the game of international realpolitik, buying the silence of their two rising and needy neighbours, democratic India as well as authoritarian China, with oil, gas and timber. However, to such a ruthlessly amoral politics, based on purely rational self-interest, the moral and spiritual values of religion can and often do pose a challenge. No doubt devotees of science and rationality will continue to call for a religion-free politics. 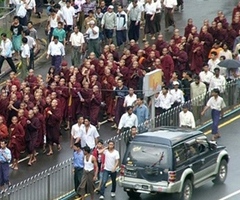 But what the Burmese demonstrators prove is that, as Gandhi said, "those who think religion has nothing to do with politics understand neither religion nor politics".